No more waiting for data crawls to finish. No more wrangling with CSV files! 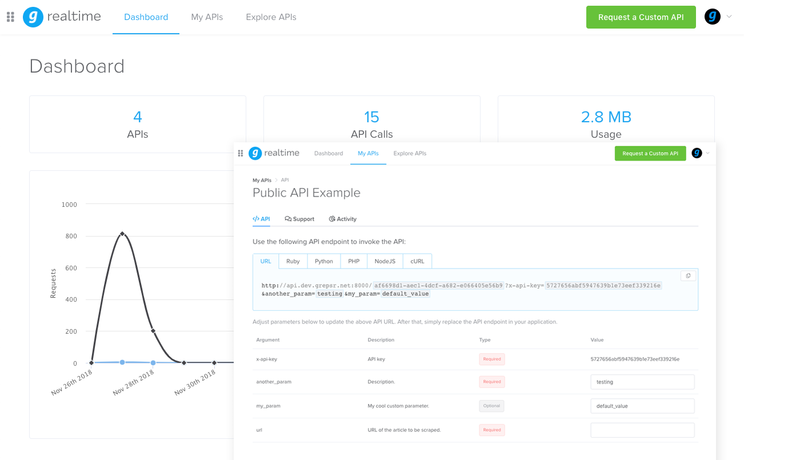 Access and execute existing as well as custom-built APIs right on our user-friendly platform. Ditch installing and managing complex third-party software and keep everyone's focus on what matters most. Quit going through training videos and guides or spending sleepless nights configuring mysterious request headers and parameters. Feel confident that there's always someone to monitor the health of your API, ensuring complete and steady streams of data. Easily customize your API endpoint by editing the request parameters and/or headers from within the project page. Then simply copy the edited endpoint — as a URL or a shell command (cURL) — and get your data within seconds! Ready to APIfy the web? Sign up and create your project to get started.